It’s okay if you are wondering who I am standing beside in the picture above. 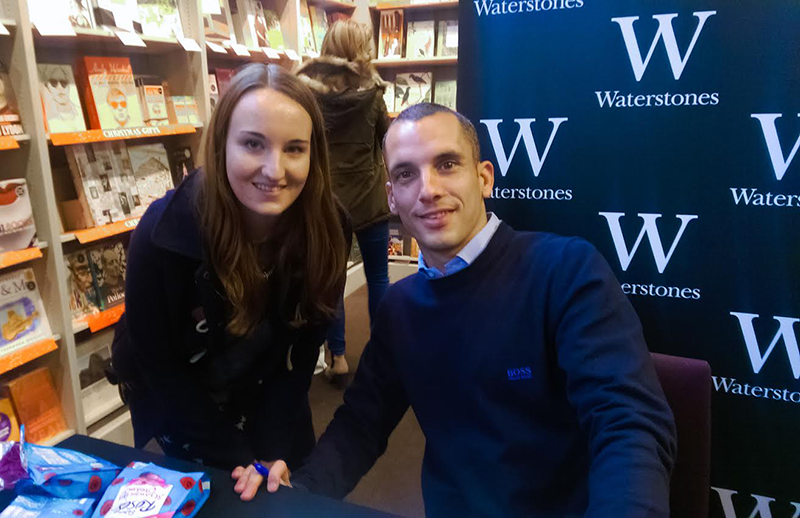 It’s Leon Osman and he plays for my beloved Everton. I went along to his book signing in Liverpool One this weekend. I’d planned on getting his autobiography for my dad for Christmas and when I found out he was doing a signing I thought I’d pop along. This week I’ve been focusing on my university work. I’ve been emailing business and preparing for interviews as a part of my research project. I’ve felt so much more focused with my project since I changed topic. I received my mark back for the literature review associated with my dissertation/research project. I scored 76% which works out as a 1st! I feel over the moon, especially considering I found it such a difficult piece of work, and the fact that all the lecturers have been saying that the work wasn’t up to usual standards. Also, I finally received some good news about my legal case. I’m still keeping it pretty private because I don’t know what the outcome is going to be, but it feels like we are getting some where. I’m just keeping everything crossed. One of the guys I support at work would be 100% jealous that you met someone from Everton, he loves them, and if he isn’t wearing an Everton shirt it’s because he is ill. His whole flat is a homage to Everton. Sounds like a great guy, haha! I love meeting famous people. I always get so nervous, even if they aren’t really that famous, I can’t imagine what I’d be like if I met an A-Lister! That’s awesome that you met an athlete on a team you love! A signed book is a great gift 🙂 I hope your dad likes it! I’m glad that you’ve been more focused after changing your research topic. Seems like that was worth it! Congrats on the score on your literature review too! Thank you! I’m actually excited for news on my legal case now rather than dreading it like I was before. That must have been a great experience for you! I got an ex-Liverpool player to sign a book for my mum over the weekend. They get a lot of stick, but all the footballers I’ve met are lovely people! You look very happy on the picture! Who brought him all the roses? Congrats on your literature review mark! That’s great! Good luck with your legal case too, hope it all goes well! He bought the Roses with him and gave them to everyone at the book signing which was super nice! I am so glad you could get a signed copy, Holly! Congrats on getting 76%. That’s a great score!